My family is a huge fan of BBQ season but, unfortunately, sometimes mother nature has other plans. This summer has been a little on the rainy side, so we’ve had to take some of our barbecuing indoors. While it isn’t ideal, it did give me time to create this low FODMAP pan-fried steak. If you love steak but the weather isn’t cooperating (or you don’t have a barbecue handy), this recipe is a great alternative. The trick to an awesome pan-fried steak is to get your frying pan as hot as possible. If you have a cast iron skillet, pull it out now. If you don’t have one, don’t worry. I haven’t convinced my husband to buy me one yet, so I use a regular old frying pan and it works just fine. Make sure you check the temperature of the pan before you get started. To test the temperature, sprinkle some water in the center of the pan. If it jumps and sizzles you’re ready to go. Think this low FODMAP pan-fried steak sounds great, but you don’t have time to try it now? Don’t forget to PIN THIS POST for later. 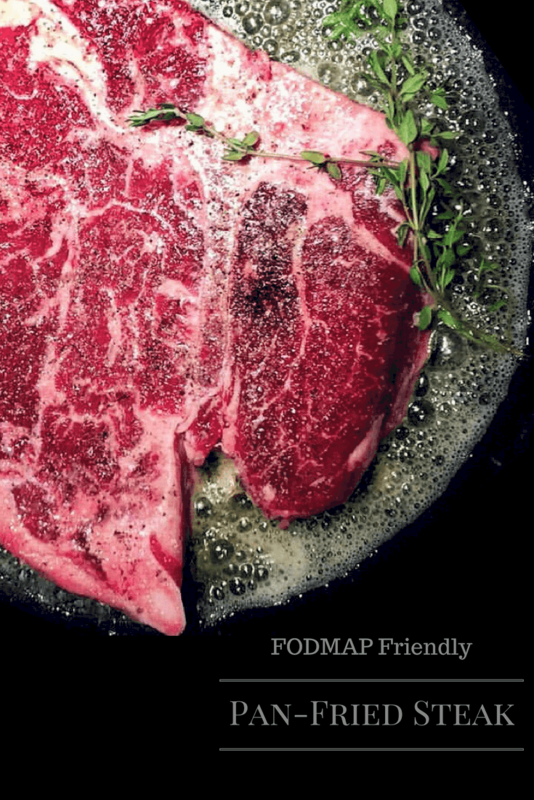 Since steak is a protein, it doesn’t have any FODMAPs. However, some people have trouble digesting too much meat in one sitting. If you notice symptoms after a meat-heavy dish, try splitting your servings over multiple meals. It’s worth mentioning that some people also have issues digesting fat. If you have trouble digesting foods like steak, try a leaner cut of beef. While this steak is delicious on its own, it’s important to balance out your meal. I was raised on meat and potatoes, so I tend to pair my pan-fried steak with either these roasted vegetables or my mini paprika potatoes and a garden salad. 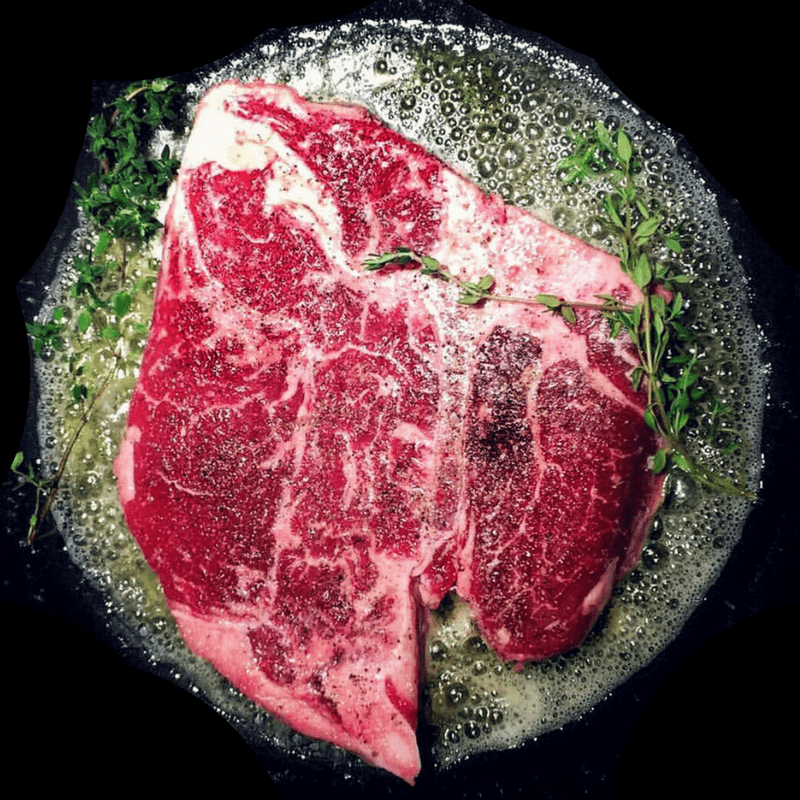 Want to try this low FODMAP pan-fried steak? Don’t forget to PIN THIS RECIPE for later. This quick and easy pan-fried steak will add a little sizzle to your low FODMAP Diet. Try it as a main dish or add it to a salad or sandwich. Heat your frying pan on high heat (until water droplet bounces and evaporates on contact with the pan). Add butter and give the pan a light shake to coat the bottom. Add steak and cook 4 minutes per side (8 minutes total). You can shake the pan lightly once or twice per side to prevent sticking. When turning the steak, add the thyme leaves to the pan. After 8 minutes, transfer the steak from the pan to a plate and cover it loosely with tin foil (you're making a tent, not a sleeping bag). Allow the steak to rest for 10 minutes - it will continue to cook during this time. Serve immediately. If you want to make this recipe with my roasted vegetables or with my mini paprika potatoes, I would recommend the following timing: 1) turn on the oven and prepare the veggies while it is preheating, 2) place the veggies in the oven, season your steak, and heat up your frying pan, 3) at the 10 minute mark, shake your vegetables and place your steak in the frying pan, 4) at the 20 minute mark, transfer the steak to your plate to rest and shake the vegetables again, 5) at 30 minute mark, remove your vegetables from the oven and plate your steak. You're good to go! This low FODMAP pan-fried steak is a great way to enjoy a steak dinner without a barbecue. If you like this recipe, sign up for my mailing list below. You’ll get new recipes and articles delivered right to your inbox.